Common advice from photography instructors and books is to “fill the frame”—get closer to your subject. The fault with many photographs is they include too much unnecessary material and the subject is too small. The usual fix is to “zoom with your feet” to get in closer and fill the frame. This advice applies to video as well which should always include close up shots. Frame grab of zoo animal video. HandlePod was braced against a barrier post. But there are subjects and places where you can’t zoom with your feet to get closer. Examples include zoos, animal parks and wildlife preserves where there are barriers or restrictions on how close you can get to the animals you want to photograph. Then the camera zoom is the only way to really get in close. Today many cameras boast an optical zoom of 50X or even 60X. That is enough to get you eyeball-to-eyeball with an orangutan. Digital zoom will get you to the moon, but don’t go there. Avoid digital zoom because it degrades the image. A super zoom can get you an extreme close up from a very great distance. The problem with zooming in that far is holding the camera steady. Human hands are not capable of maintaining a steady shot at fifty times zoom and video shake is unavoidable. Optical camera stabilization helps but is not a total solution. A video tripod with a fluid head would solve the problem, but who carries that for a day at the zoo? Check out this link for tips on zoo photography. HandlePod is a pocket size camera support that delivers the stability to let you zoom in close and avoid video shakes. 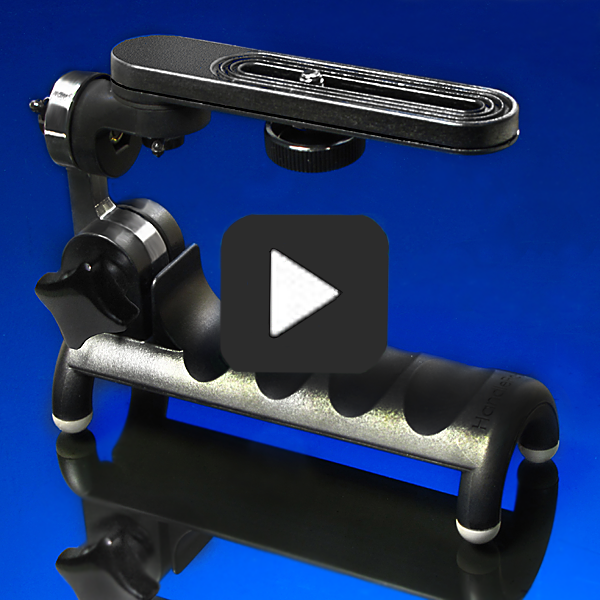 Just press the HandlePod against any convenient support, compose and shoot. And there are plenty of support objects to brace against, especially at zoos. Rails, barriers, walls—the things that separate you from the animals are the things you can use to stabilize the camera and get in as close as you want. Seal at a marine reserve. Frame from video shot from a cliff above the beach. HandlePod was braced on a fence. Wildlife parks and nature preserves are more of a challenge, but there is usually something to brace against. If not, HandlePod still helps by providing a firm handle and added leverage to make hand support easier and more stable. Even at a 50X zoom your video will be smoother and steadier than it would be just holding the camera alone. HandlePod lets you zoom with confidence that your video will not make viewers dizzy and induce nausea. Use that super zoom to get up close and personal with lions and tigers and bears, oh my! Tame that super zoom to make your wild animal video something special. This entry was posted in Camera Stabalization, Hand Held Stability, Shake Free Video, Tripod Alternative on February 13, 2015 by main user.